It was a real thrill to have Wayne Mackintosh out to UBC to talk with characteristic passion about WikiEducator. There is so much to admire about this project: its deep commitment to openness, a technology platform that is both simple and powerful, its innovative approach to training and a community engagement and governance model that is second to none. 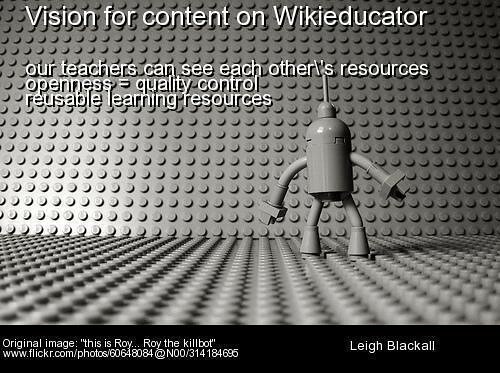 The other extension is the WikiEducator Package Export, which will export a collection of wiki contents as an IMS Content Package, which can then be imported into a learning management system. Oh, did you know that Open Office exports in MediaWiki format? Nothing warms me up so much as yummy radical reuse… This work, in addition to MediaWiki’s other strengths (and the possibility of syndicating MW content via embed code and plugins) makes the case for using MW as a core collaborative authoring engine publishing across multiple applications. On a personal note, Wayne is leaving Vancouver to take on a post with the new International Centre for OER at Otago Polytechnic… Otago has already demonstrated their leadership with open learning (and it’s mind-blowing to ponder what kind of stuff Wayne and Leigh might get up to being at the same institution). It’s been a pleasure to interact with Wayne both here in Van Rock City and as a travel-mate for events elsewhere… and he will be missed on the wet coast. Happy trails Wayne! Excellent stuff. I really like MediaWiki despite its stubborn lack of anything approaching a real GUI. These tools look to help–a lot. Thanks.